NS 50 Let Pobedy , translated as 50 Years of Victory or Fiftieth Anniversary of Victory, is a Russian Arktika class nuclear powered icebreaker. Construction on project no. 10521 started on October 4, 1989 at the Baltic Works in Leningrad (currently Saint Petersburg), USSR. Originally the ship was named NS Ural. Work was halted in 1994 for lack of funds, so that the actual fiftieth anniversary of Victory Day, in 1995, found the ship in an abandoned state. Construction was restarted in 2003. On 30 November 2004, a fire broke out on the ship. All workers aboard the vessel had to be evacuated while the fire crews battled the fire for some 20 hours before getting it under control; one worker was sent to the hospital. There was no threat of radioactive contamination as the nuclear reactor did not yet have fuel inside. She was finally completed in the beginning of 2007, after the 60th Anniversary. The icebreaker sailed into the Gulf of Finland for two weeks of sea trials on February 1, 2007. Upon completing sea trials, the icebreaker returned to St. Petersburg Baltic shipyard and started preparations for her maiden voyage to Murmansk. The new ship showed superior characteristics for an icebreaker, such as exceptional maneuverability and a top speed of 21.4 knots (39.6 km/h; 24.6 mph). 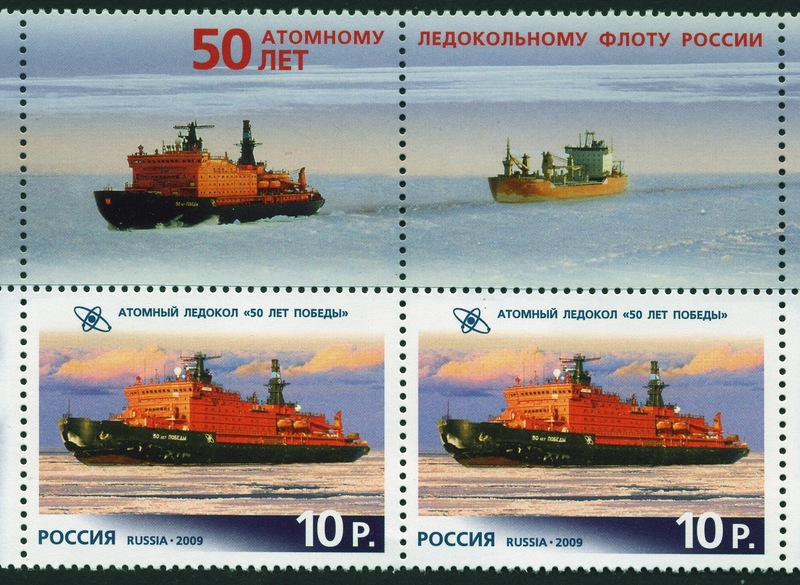 She arrived at her homeport Murmansk on April 11, 2007. The icebreaker is an upgrade of the Arktika-class. The 159.60 m (524 ft) long and 30.0 m (98 ft) wide vessel, with a displacement of 25840 metric tons, is designed to break through ice up to 2.8 meters thick. She has a 140-man crew. Fiftieth Anniversary of Victory is also an experimental project; for the first time in history of the Russian icebreakers it used a spoon-shaped bow. 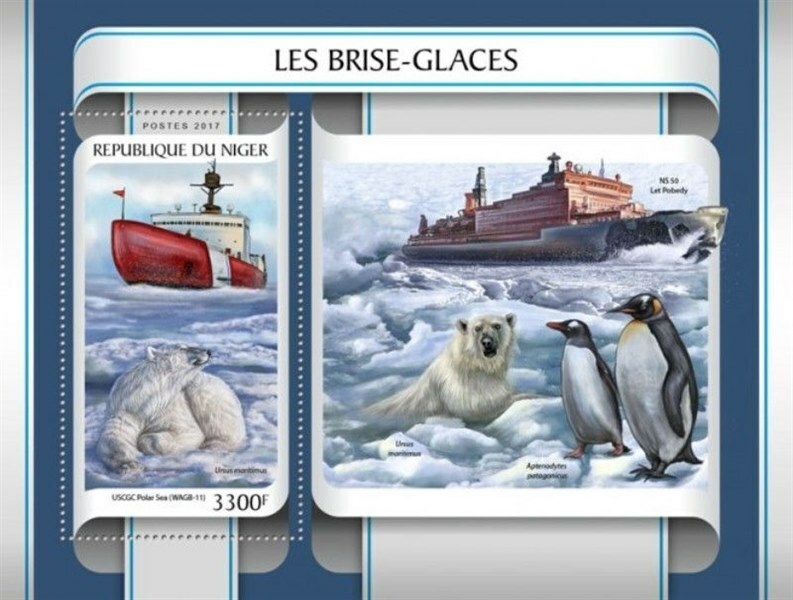 As predicted by the ship's designers, such a shape increases the efficiency of the ship's efforts in breaking the ice. The icebreaker is equipped with an all-new digital automated control system. The biological shielding complex was heavily modernized and re-certified by the State Commission. A new ecological compartment was created. The ship has an athletic/exercise facility, a swimming pool, a library, a restaurant, a massage facility, and a music salon at the crew's disposal. A group of eclipse chasers have used the vessel to observe the eclipse of August 1, 2008. 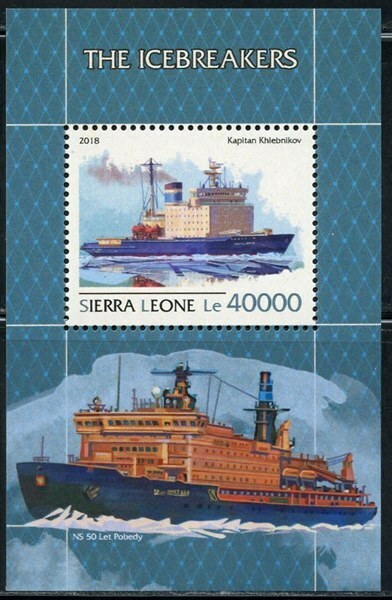 They departed from Murmansk on July 21, 2008 and reached the North Pole on July 25, 2008, which sets a speed record for the ship (the trip lasted 4 days instead of 7). 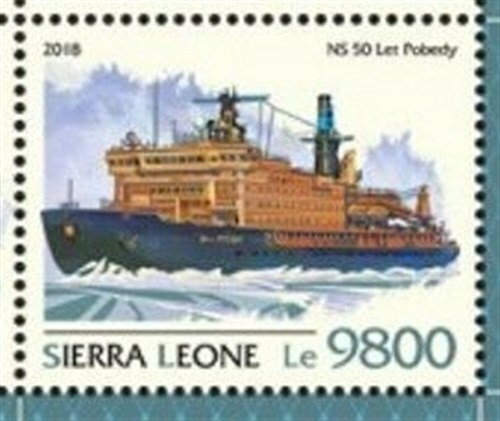 Sierra Leone 2018 MS and stamp Le9800 sg?, scott?